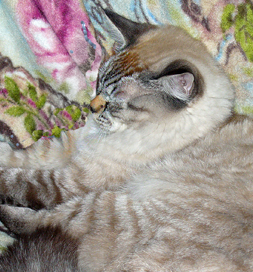 The passing of her 21-year-old cat, Jazzy Kitty, devastated Joyce Baker of Juneau, AK. Anyone who suffers the death of a pet knows how she felt – as if there were a bottomless hole in her heart. She decided the only way to repair that hole was the love of another kitty. Read Diablo’s story in Joyce’s words. She had adopted Jazzy Kitty from Gastineau Humane Society in Juneau, so through Petfinder, she logged onto its website. Her first experience with them had been so good, why not try again? Though skittish when she first brought him home, he has now come out of his shell to emerge as his true self. “Not a day goes by where we don’t amuse each other,” she says. And the hole left in her heart is gradually knitting over.